The weeping bottlebrush tree, otherwise known as creek bottlebrush, Melaleuca viminalis, or Callistemon viminalis, is a tropical plant in the myrtle family, Myrtaceae. It's endemic to New South Wales, Queensland, and Western Australia. This Australian native likes to grow in zones 9-11. This weeping tree will grow to be 15-20' tall and wide. If it's not pruned, it will form into a round shrub. Plant where it can receive full sun. While it will grow in areas with part shade, you run the risk of having fewer blossoms. The way that the leaves hang off the branches of this tree is reminiscent of the weeping willow. Each will be lance-shaped and up to 4" long. Strangely enough, the red "flowers" you see are a collection of red stamens that are produced during spring and summer, as well as other times throughout the year potentially. The fruit is a hard brown capsule. Some people can be allergic to the pollen, so verify that no one in your household is susceptible before you plant it. This tree is one of the trees that will attract hummingbirds. With its scarlet blossoms, it'll attract hummingbirds, other birds, and insects like bees. There won't be much mess from fallen flowers or leaves, so this won't be a problem if it's planted by a pool. Drought and salt tolerance are features of the weeping bottlebrush. 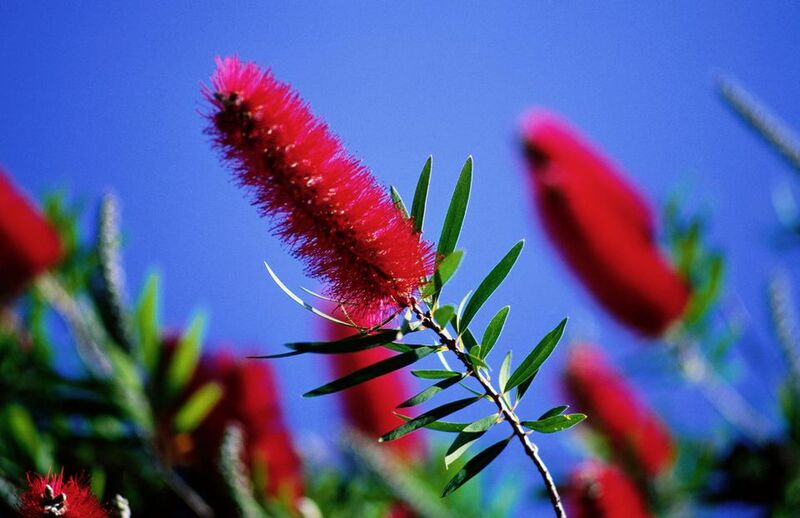 The best soil for a weeping bottlebrush will be well-drained to prevent problems with rot and fungi. Fertilize during spring and summer to promote growth and health. You will need to train it to a tree form so it will exhibit the weeping shape. Otherwise, it can turn into a shrub that can be used as a hedge. You may find mites show up on the tree. Treat them with horticultural oil. Witches' brooms may also form in the branches, which can just be pruned away for aesthetics. Make sure there's not a bigger problem such as pests or diseases causing the witches' broom, or there may be more severe problems if left untreated. Don't plant this in wet soil. Too much moisture may cause cankers or root rots. Another problem that the tree can face is the Sphaeropsis gall. Cut off any branches infected with a gall to help stop the spread.